The MOBIUS catalog is a consortium catalog comprised of holdings from almost all academic libraries in Missouri, as well as several Missouri public libraries and the Missouri State Library. Columbia College Students who are residents of Missouri can search across all holdings and request items be sent to any MOBIUS Library for pick-up. Generally it takes three to four working days for a book to arrive at the pick-up location. You will then be prompted for your full name, student ID number, and the location where you would like to pick up the book. 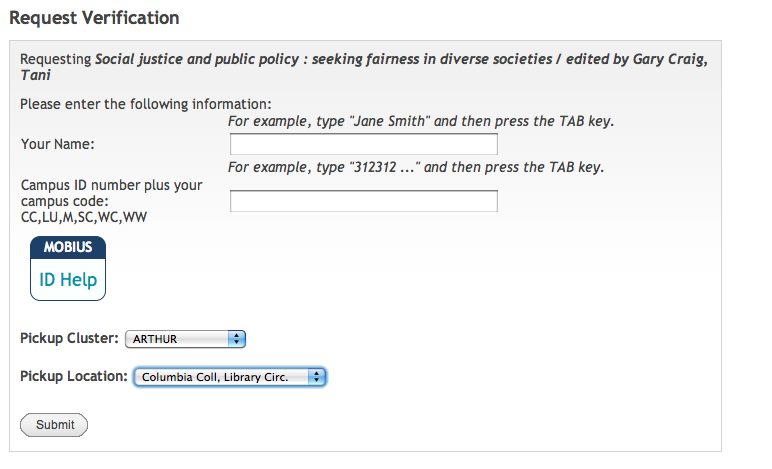 Note that you will need to add the Columbia College campus code "cc" to the end of your student ID number. For example, if your ID number is 1234567, you would type in 1234567cc.